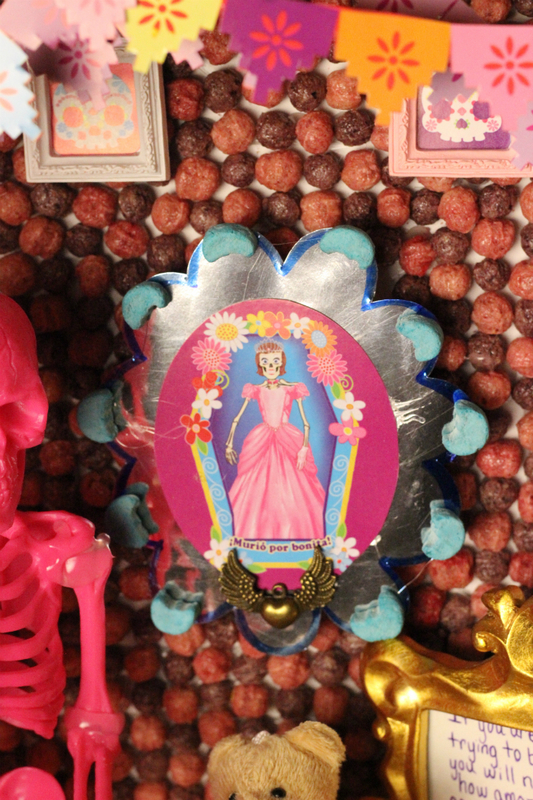 Día de los Muertos Retablo made with Cereal - Fueled by chile, frijoles & tortillas. This is a sponsored post written on behalf of Walmart. All opinions are my own. The colors. The history. The beauty of Día de los Muertos is really what has captivated our attention when it comes to this Mexican tradition. We’ve mentioned before how Day of the Dead wasn’t always something we celebrated. 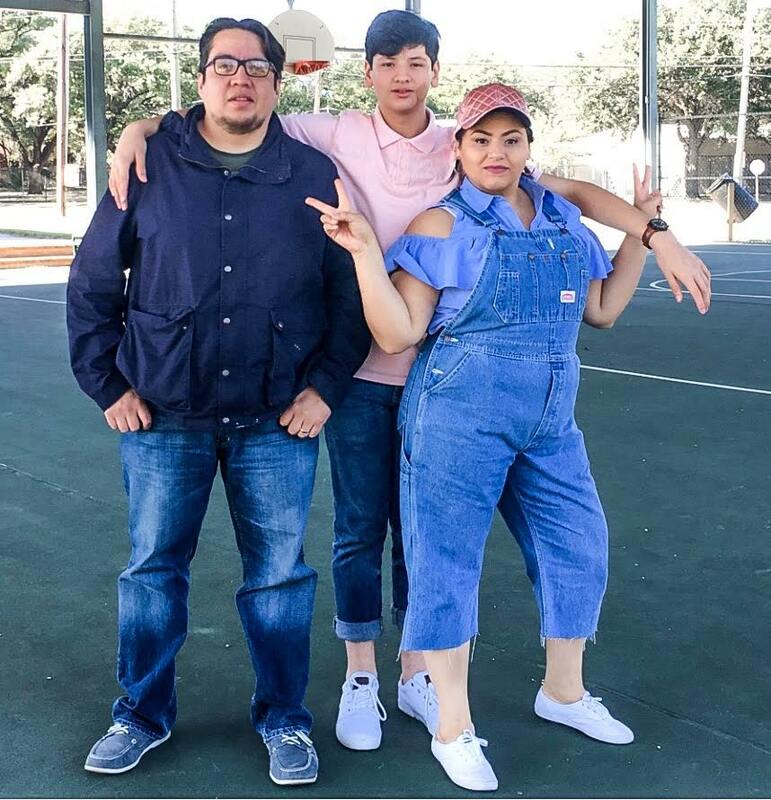 Growing up, our families did always have their own way of honoring our loved ones who had passed, but it didn’t really involve the full Día de los Muertos experience. It wasn’t until later on in life that both Juan and I decided Day of the Dead was something we indeed want to observe and celebrate. For us, it’s a celebration of our culture and an expression of the respect and honor we feel for our loved ones. Not only when they are alive, but also when they are no longer with us. I’ve actually created and submitted a few retablos to local art exhibits for Day of the Dead before. 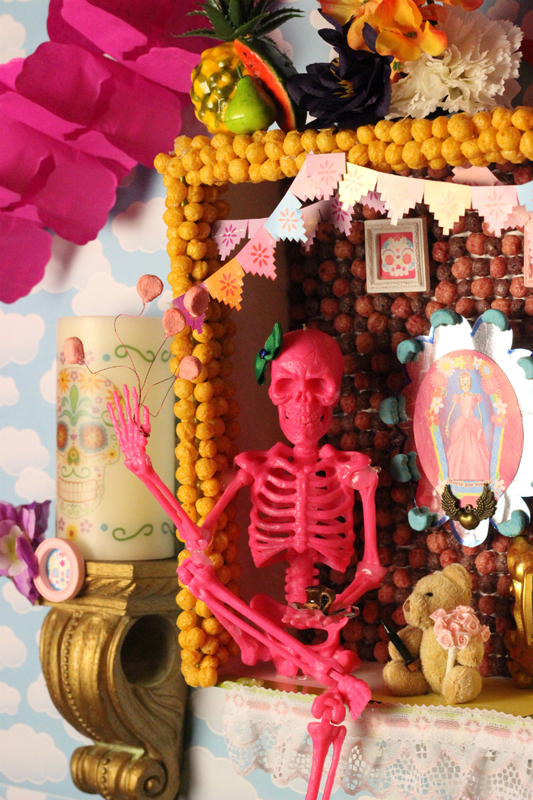 This year, when we were invited to share our Día de los Muertos experience by General Mills, I knew a retablo would be perfect. 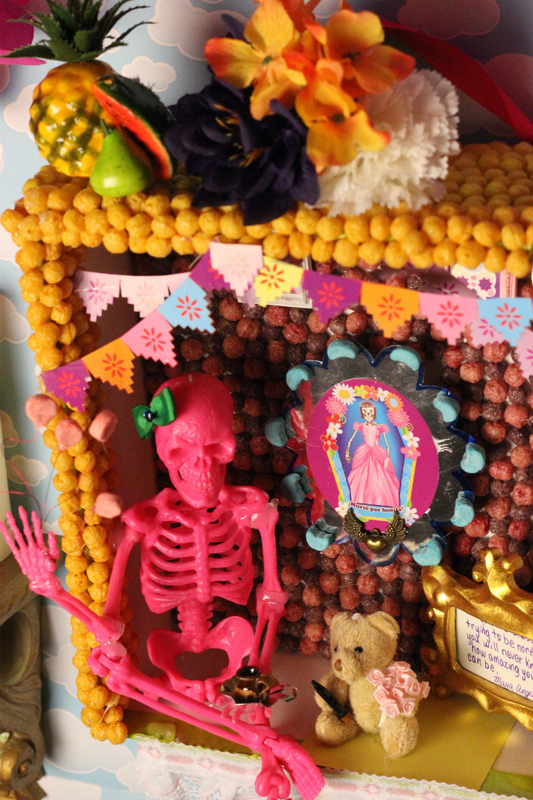 In case you’re not familiar, a retablo is basically an alter piece made to pay one’s respect to a specific loved one or loved ones on November 1 and 2 – Day of the Dead. The alters are meant to represent the individual being honored, whether that be through specific items, pictures, or even treats. Anything that you think your loved one would really enjoy! 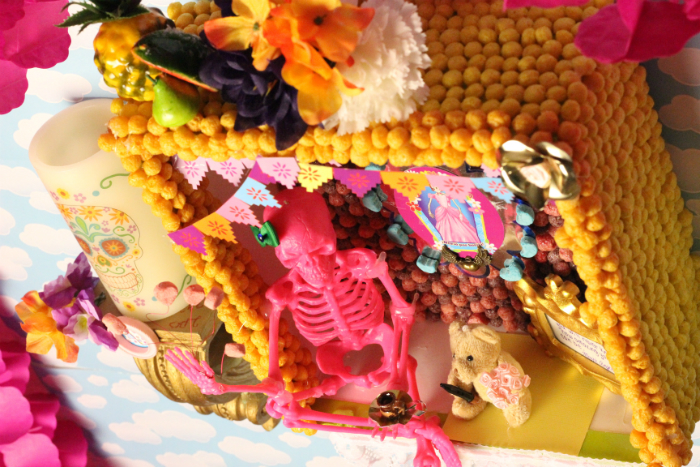 In this case, my retablo is made almost completely of cereal. 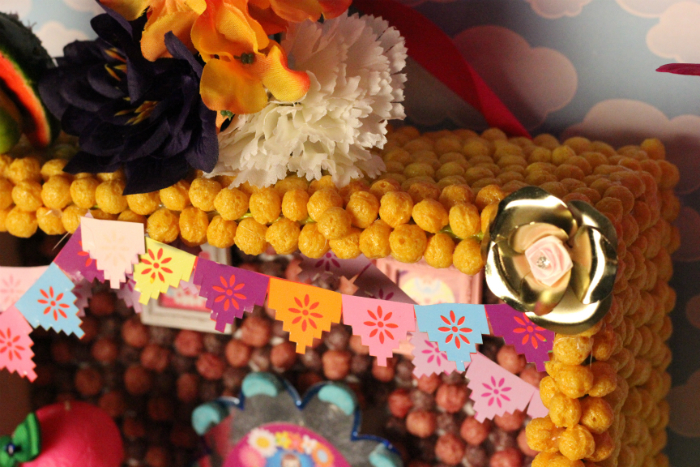 I used Trix and Lucky Charms purchased at Walmart to decorate the retablo inside and out. Underneath all of that tasty goodness is actually a shoe box I had laying around. 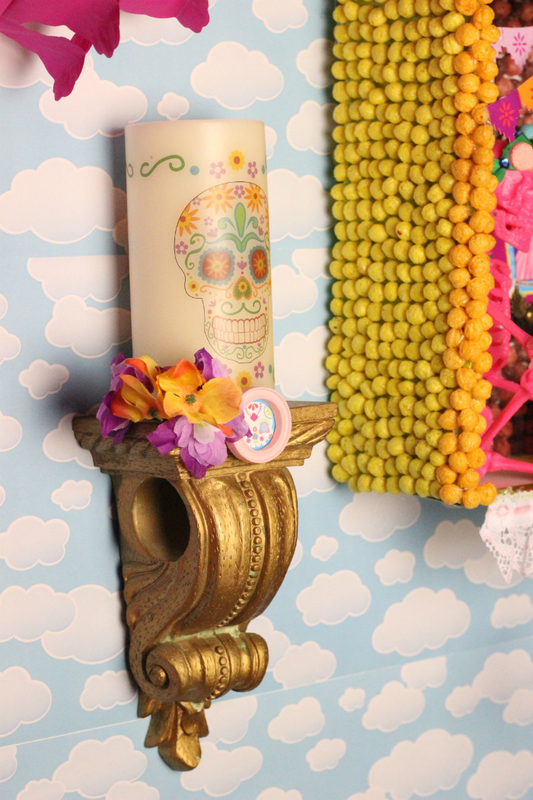 Once the foundation was built, I focused on adding a lot of little details to my retablo. You can’t celebrate Day of the Dead without having at least one Catrina. Papel picado made a perfect accessory. 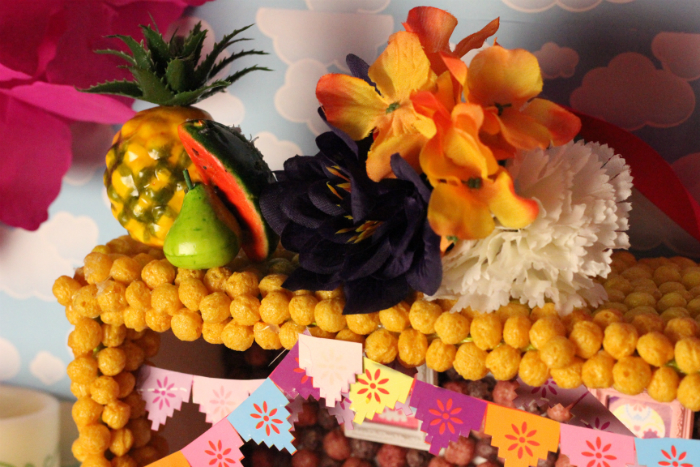 I had some colorful plastic fruit and flowers that ended up looking pretty good on the outside of my alter piece. These candles I already had in my Día de los Muertos collection. And I couldn’t resist making a couple of balloons with my Lucky Charms. 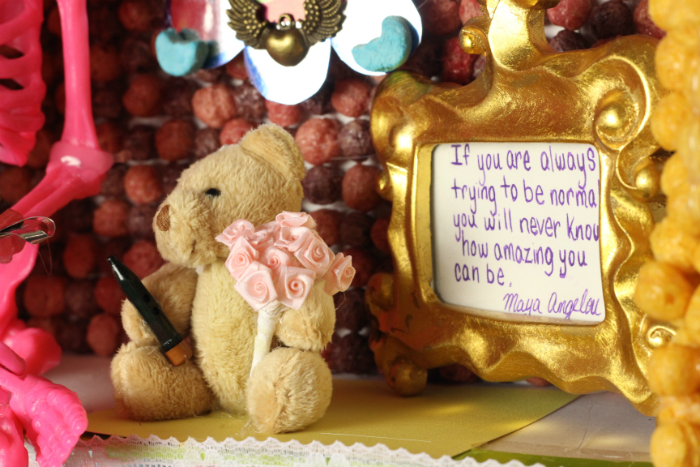 This quote by Maya Angelou is one of my favorites. 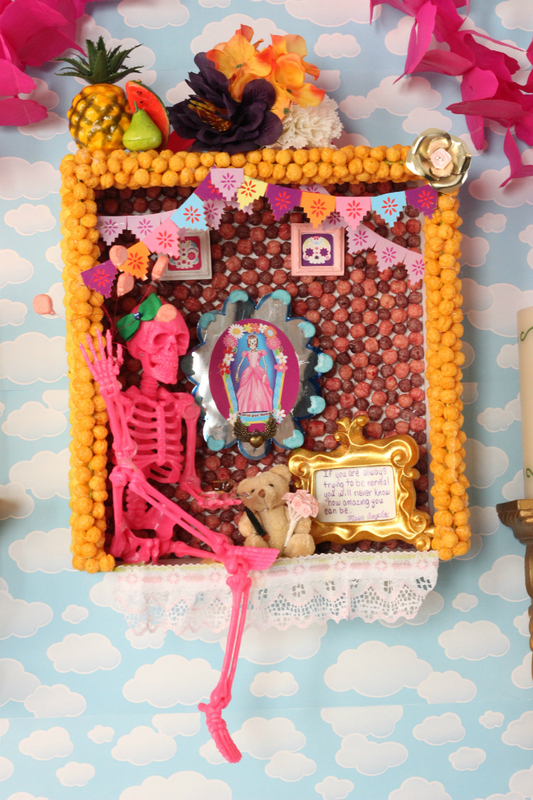 This retablo was a lot of fun to make. And guess what? It’s already sparking a lot of conversation around the tradition of Día de los Muertos in our household (including from Edgar).